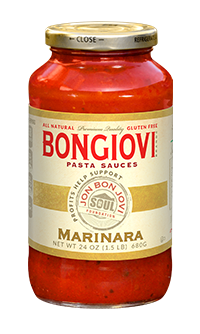 ALL NATURAL | GLUTEN FREE Bongiovi Brand Arrabbiata Pasta Sauce is for those who like a little spice in their lives. 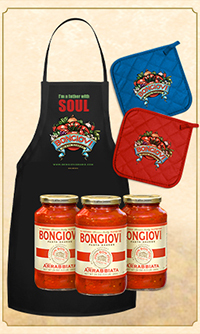 The cool tomato and basil flavors are kicked up with just the perfect amount of a special pepper combination for just the right bite. This sauce is awesome The taste is just right and just the right amount of HEAT Will be buying more And the fact that it helps people in need is great. 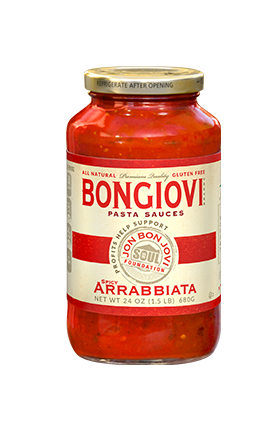 I love Jon's music and I love the sauce. I love this sauce! The spice is just enough to give it a kick, but not so hot that you can't enjoy it. Delicious!!! The spice is just perfect in this one! Gotta get me some more! I am heading to the store to buy this tomorrow. 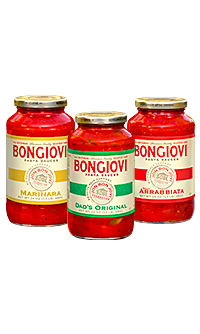 Anything with the bongiovi (bon jovi)name on it has got to be good. Love that every jar helps the needy. That is awesome!! !